Regular readers will know that I suffer from problematic skin, and am always on the look out for products that will not only improve the look of my skin, but also maintain it when it gets to a healthy stage. Recently I’ve stuck to a strict routine in the mornings and the evenings (which I’m pretty proud of. I’m usually a bit of a lazy bones and often reach for the baby wipes as a quick fix. Tut Tut!) that has had a huge impact on the condition of my skin. 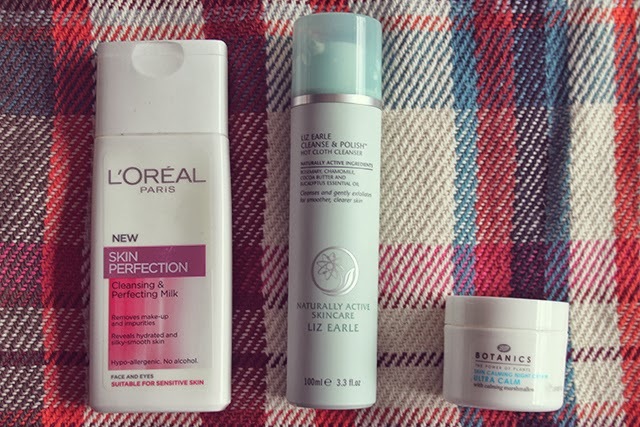 I’ve wanted to shout about this to you all for a few weeks now, but I kept it quiet until I was absolutely sure it was right for me, and the to make sure my skin didn’t have any funny turns when using the products! The first thing I do when I wake up is go straight to the bathroom to wash my face. I have combination skin with quite an oily T zone, so I often wake up with a very oily forehead and nose, which I like to fix straight away. First of all I wash my hands before touching my skin to be sure I’m not spreading germs to my face, then splash the skin with lukewarm water. 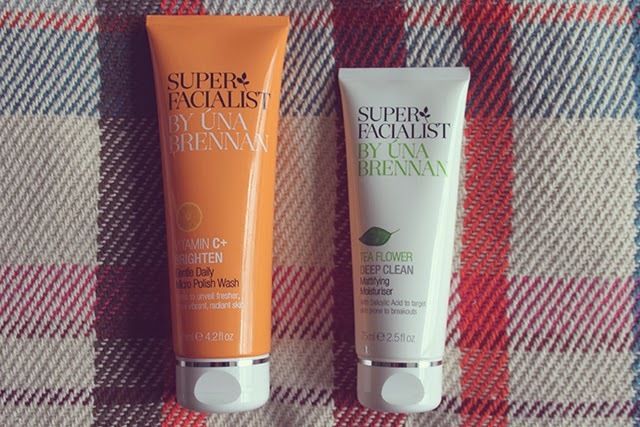 I then massage a small amount of the Super Facialist by Una Brennan Vitamin C Brighten Gentle Daily Micro Polish Wash in circular motions all over my face and neck for a good few minutes. I love this product so much. 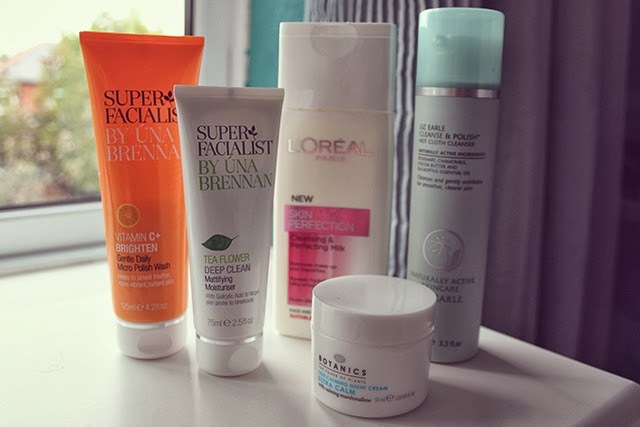 I heard about Una Brennan after watching a video by Anna where she raved about a mask from the range, and when I spotted it in my local Boots I thought I would give it a whirl, as she has the most amazing skin! This wash is an exfoliating scrub which has tiny micro beads in it that get rid of dead skin, and has a gorgeous fruity orange smell which really wakes up my skin. Once massaged in, I take a clean flannel and soak it in hot water, then use it to take all the product off my face. I finish off by rinsing with lukewarm water to ensure all the beads have gone, and pat my face dry with a clean towel. After this I apply a thin layer of the Una Brennan Tea Flower Deep Clean Mattifying Moisturiser to the face and neck. Having oily skin means I rarely find moisturisers that do anything other than clog up my pores and cause break outs. This one is so super light and helps to reduce oiliness whilst keeping my skin soft at the same time. At night I obviously have a layer of makeup to take out, so there are a few more steps to the routine compared to the morning. I start off my tearing a cotton pad in half, and squirting some of the L’Oreal Skin Perfection Cleansing & Perfecting Milk on to each piece. I use this to take my eye make up off as it sweeps off mascara really easily without hurting my eyes. Once all the eye makeup is off, I head to the bathroom and wash my hands, before applying my all time favourite skincare product, my holy grail, the Liz Earle Cleanse & Polish Hot Cloth Cleanser. I massage one pump of this all over my face and neck, then I take one of the muslin cloths from the same range, and run it under hot water. I wring out the excess, then use the hot cloth to wipe off the product, which in turn takes off the rest of my make up. Once all off, I rinse off the cloth then repeat the process again with another pump of the cleanser, and wipe off again. I then splash my face with warm water to get rid of any left over product, and pat my face dry with a clean towel. To finish the routine, I reach for another new moisturiser I have discovered, which is the Boots Botanics Ultra Calm Skin Calming Night Cream. This is thicker than the Una Brennan one I use in the morning, as with most night creams as they are designed to soak in over time, but this doesn’t clog my pores or make my skin feel heavy at all. It’s made to calm the skin and reduce break outs, which it does perfectly and means I wake up with a clear complexion and spot free! So that is my skincare routine that I’ve been sticking to lately. I’m not saying you should go out and buy all these products, because they may not work for you and your skin type. These are just the products that I have found to work for me, finally! What products are in your current skincare routine? Have you tried any of the ones I am using? That vitamin c product sounds amazing!